and popular sights all around! 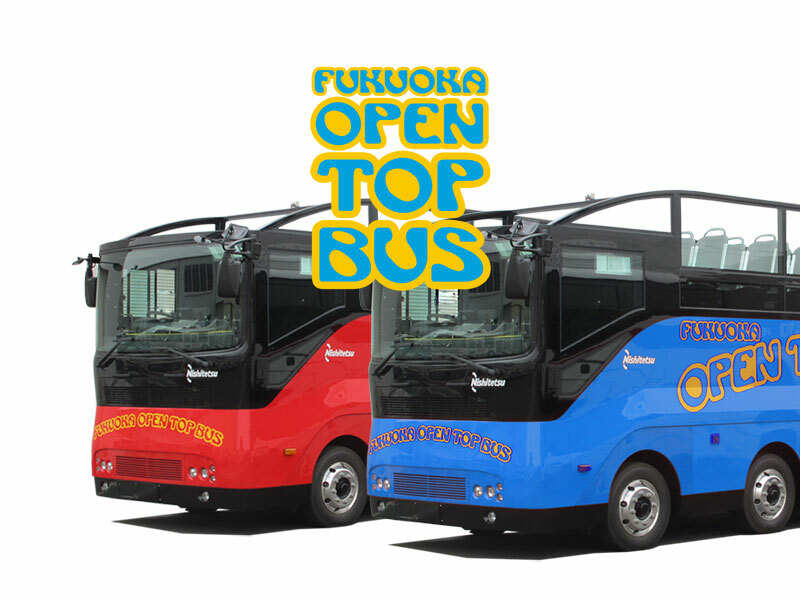 What is Fukuoka Open Top Bus? ■The timetable will be revised in April 1. The following trips will be suspended. Thank you for your understanding. 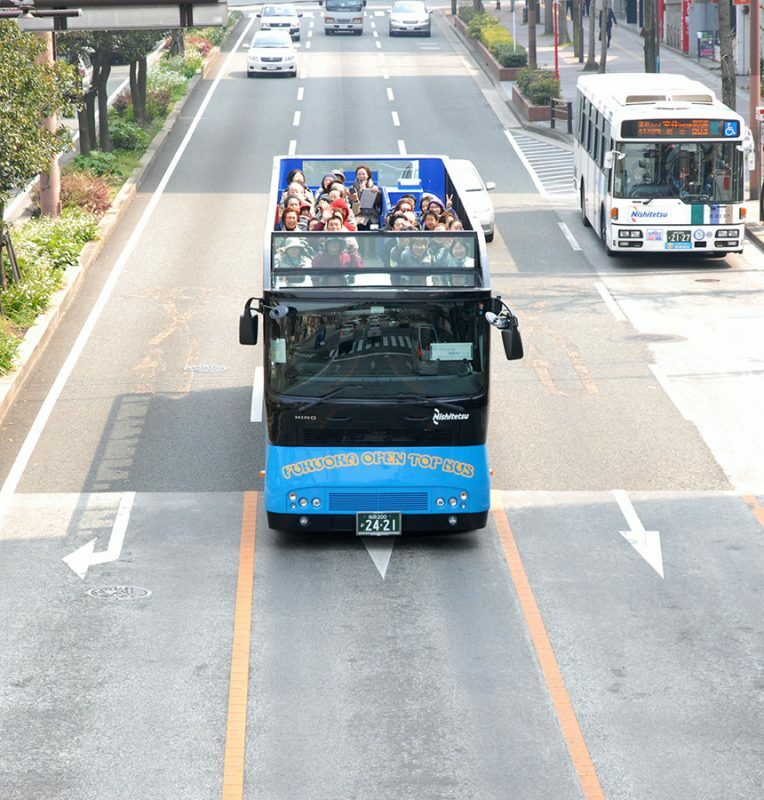 1.The first Japanese-manufactured Open Top Bus in Japan! 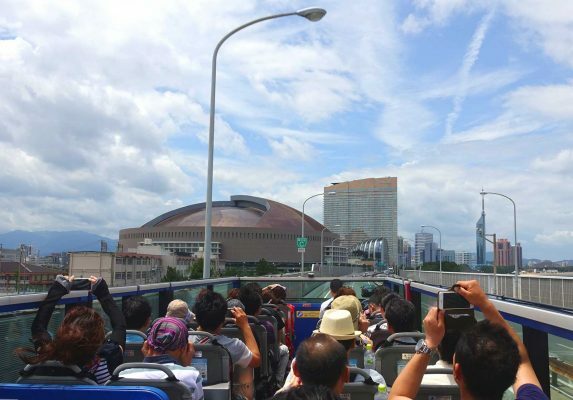 It is a two-story, open top bus which guides passengers around to the main sights in Fukuoka city, “The gateway to Asia”. It visits locations such as Tenjin, Hakata, and the seaside areas! This open top bus is the first domestic and manufactured on special request. 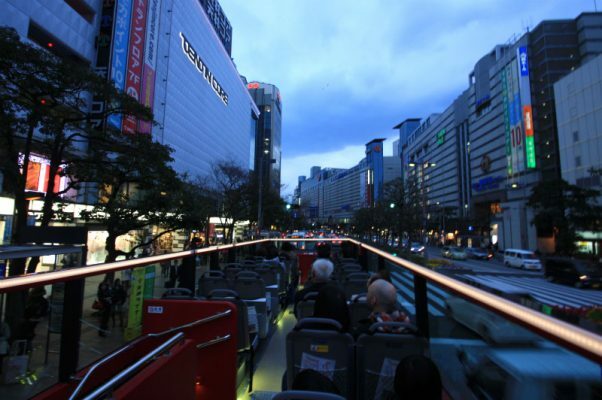 From a vantage point of about 3.2 meters up, you can get a taste of Fukuoka’s cityscape, one which is out of the norm! 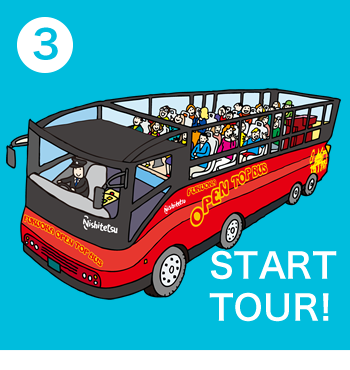 Enjoy city sightseeing along with nature and the wind in your hair. It’s like an amusement park attraction, and is just a joy to ride! 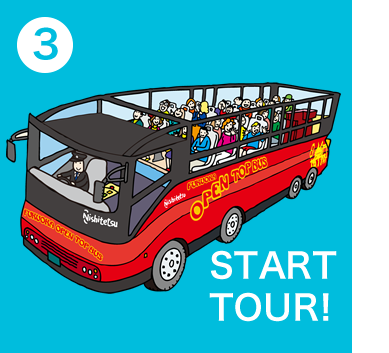 On the Fukuoka Open Top Bus, a “bus announcer”, called a “basuana” in Japanese, will provide guidance along the tour! 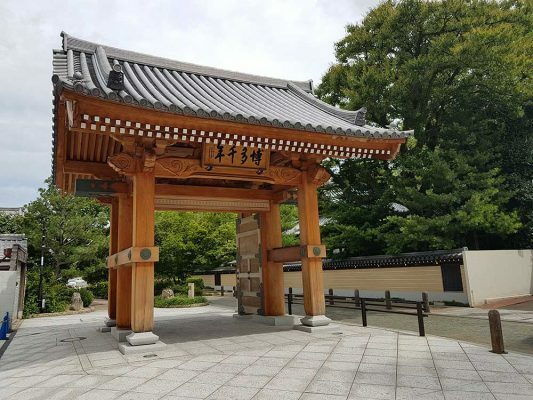 These live hosts will introduce Fukuoka’s charm, seasonal information, and share recommended tourist spots along routes. Feel the sea and city. Explore the excitement of city nights. ※Please buy a ticket to ride the bus. ※Children under the age of 4 are not permitted to ride. 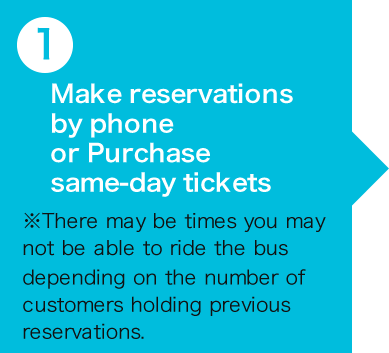 Reservation by phone, and change of reservation quests, are to be made no later than 1 hour before departure on the day you wish to ride the bus. City buses are available free of charge! 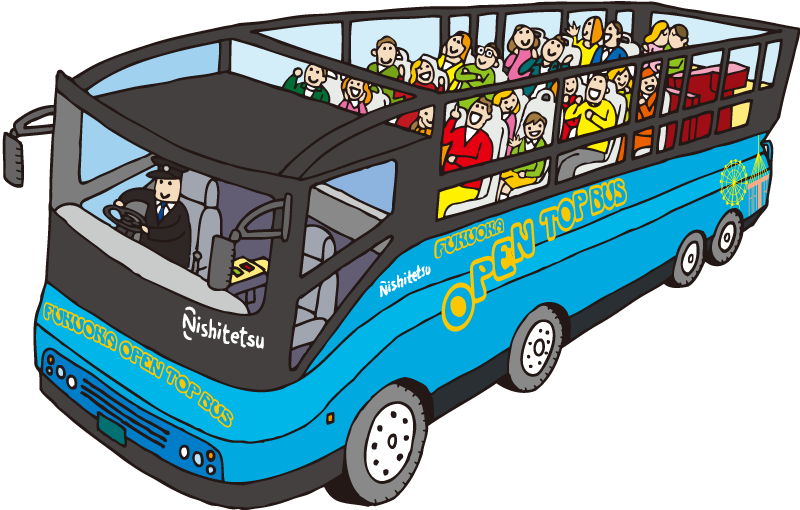 You can receive various discounts and special services by showing a Fukuoka Open Top Bus ticket at various stores and facilities. 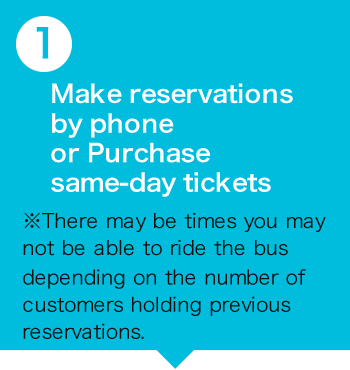 Reservation by phone, and change of reservation quests, are to be made no later than an hour before the departure on the day you wish to ride the bus. *Please buy a ticket at the ticket counter located in Fukuoka City Hall no later than 20 minutes before scheduled departure time. 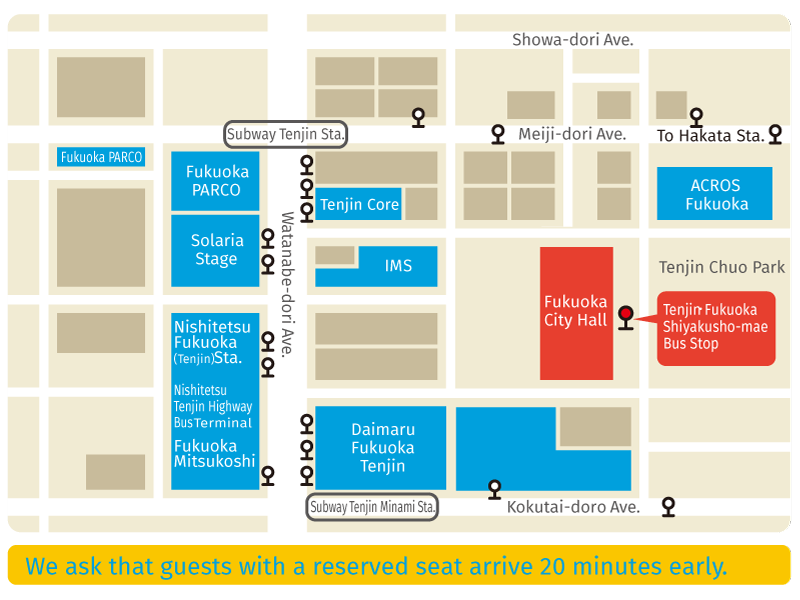 ３）Get on at “Tenjin / Fukuoka City Hall” bus stop! Can reserve your seat from 1 month prior to the departure day. contact the Kyushu Highway Bus Reservation Center. Cancellation should be processed online no later than 30 minutes prior to the departure time. *No reservation can be completed without payment. *If the payment is not confirmed by the payment deadline, your reservation will be automatically cancelled. 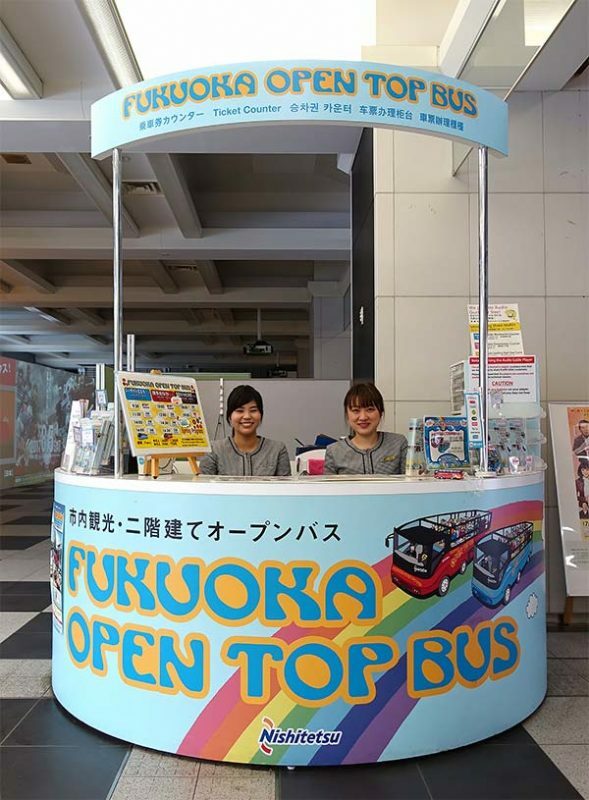 After making your reservation/payment, either bring the printed WEB voucher or present the voucher on your cell phone/smartphone at the ticketing counter on the 1st floor of Fukuoka City Hall (boarding area) to redeem the boarding pass for the Fukuoka Open-top Bus on the departure day. *Note that vouchers are not boarding passes. 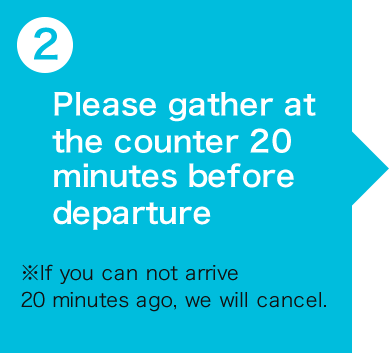 *Redeem your voucher at the ticketing counter no later than 20 minutes prior to the departure time. *Note that you cannot board the bus with the unredeemed voucher. 5）Get on at “Tenjin / Fukuoka City Hall” bus stop! no later than 20 minutes before the scheduled departure time. 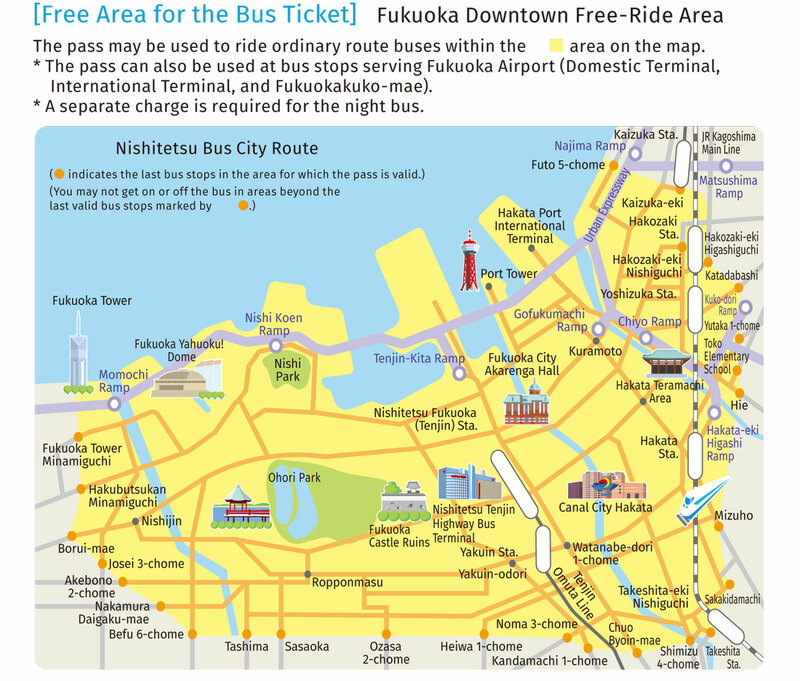 2) Get on at the “Tenjin – Fukuoka City Hall” Bus Stop! depending on the number of customers holding previous reservations. 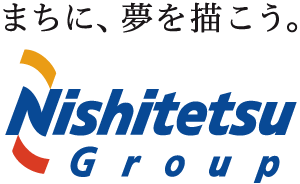 * Guests with a reserved seat must get on the bus at the Tenjin・Fukuoka Shiyakusho-mae bus stop. * Please buy a ticket on the same day that you will take the bus tour. * For safety reasons, children under 4 years of age are not allowed on the bus. 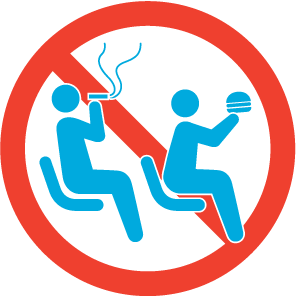 * You must wear a seatbelt when on the bus and heed the instructions of bus staff. We reserve the right to suspend or cancel tours due to circumstances that may compromise safety, such as stormy weather or the issuance of an official storm advisory or alert. On rainy days we will hand out rain ponchos. Tours may also be suspended. We are unable to offer refunds when wishing to disembark mid-tour. There are no toilets on the bus nor toilet stops along the way. Traffic restrictions due to public events, etc., may cause changes in the route or suspension of the tour. 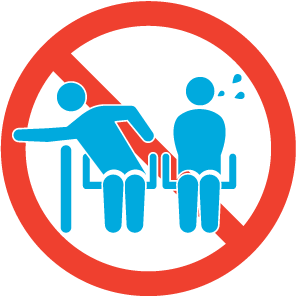 Please hold the hands of accompanying children until they are seated when boarding the bus and when disembarking the bus. Please follow the instructions of bus staff at all times. Your clothing may get wet or dirty from rain, tree sap, or bird droppings, etc. 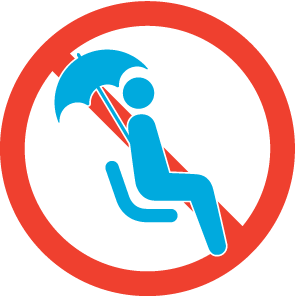 Be careful that your carry-on luggage is not blown off the top deck of the bus. 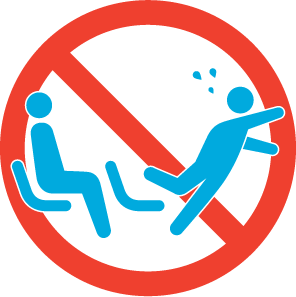 Be careful when climbing or descending the steps of the bus. The steps are slippery when wet. Please do not touch the leaves of trees that line the city streets from the top deck of the bus. Guests are responsible for their own protection from the weather to prevent sunburn, heat exhaustion, or chills. 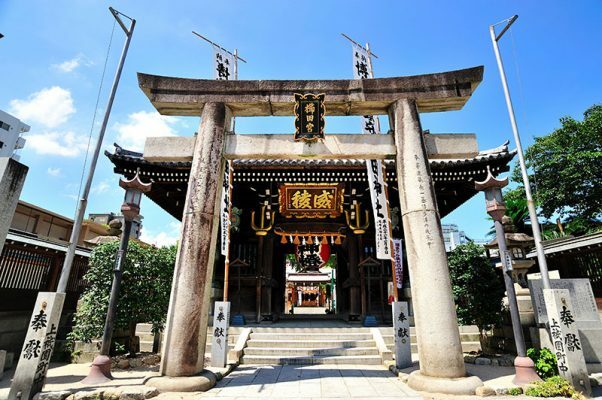 Nishitetsu takes no responsibility for any harm to guests due to the above causes.